Imagine the impact of a full cinematic experience right in your own home! Palliser® Home Theater Seating combines unparalleled comfort, sophisticated design and all the features you need to help create the ultimate home theater. This modular system is available in straight or curved configurations. You can customize the configuration to fit your family size and living space with as many seats across as you need. This product ships with fully attached arms and wedges. 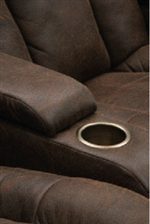 The Rhumba 3-Piece Upholstered Reclining Theater Seating at Rotmans in the Worcester, Boston, MA, Providence, RI, and New England area. Product availability may vary. Contact us for the most current availability on this product. 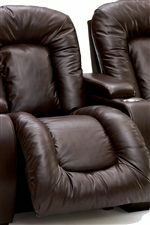 41918-1R Manual Recliner 1 39" 66" 43"
41918-3R Manual RHF Recliner 2 32" 66" 43"
Fabric Options Over 300 leathers and fabrics to choose from. Arm Soft smooth track arms add support and comfort. The Rhumba collection is a great option if you are looking for Casual furniture in the Worcester, Boston, MA, Providence, RI, and New England area.